Today, we’re announcing a data warehousing migration offer for qualifying customers, one that makes it easier for them to move from traditional data warehouses such as Teradata, Netezza to BigQuery, our serverless enterprise data warehouse. For decades, enterprises have relied on traditional on-premises data warehouses to collect and store their most valuable data. But these traditional data warehouses can be costly, inflexible, and difficult to maintain, and for many, they no longer meet today’s business needs. Enterprises need an easy, scalable way to store all that data, as well as to take advantage of advanced analytic tools that can help them find valuable insights. As a result, many are turning to cloud data warehousing solutions like BigQuery. BigQuery is Google Cloud’s serverless, highly scalable, low-cost enterprise data warehouse designed to make all data analysts productive. There’s no infrastructure to manage, so you can focus on finding meaningful insights using familiar Standard SQL. Leading global enterprises like 20th Century Fox, Domino's Pizza, Heathrow Airport, HSBC, Lloyds Bank UK, The New York Times, and many others rely on BigQuery for their data analysis needs, helping them do everything from break down data silos to jump-start their predictive analytics journey—all while greatly reducing costs. Here’s a little more on the benefits of BigQuery in contrast to traditional on-premises data warehouses. 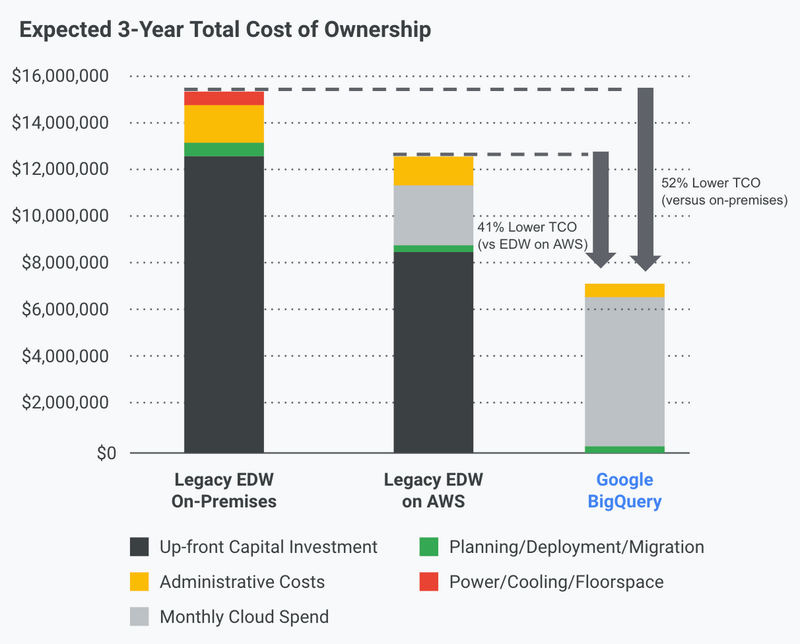 Recently, independent analyst firm Enterprise Strategy Group (ESG) released a report examining the economic advantages of migrating enterprise data warehouse workloads to BigQuery. They developed a three-year total-cost-of-ownership (TCO) model that compared the expected costs and benefits of upgrading an on-premises data warehouse, migrating to a cloud-based solution provided by the same on-premises vendor, or redesigning and migrating data warehouse workloads to BigQuery. ESG found that an organization could potentially reduce its overall three-year costs by 52 percent versus the on-premises equivalent, and by 41 percent when compared to an AWS deployment. You can read more about the above total cost of ownership (TCO) analyses in ESG’s blog post. Data migration: the transfer of the actual data contents from the data warehouse from the source to the destination system. Schema migration: the transfer of metadata definitions and topologies. Workload migration: the transfer of workloads that include ETL pipes, processing jobs, stored-procedures, reports, and dashboards. Today, we’re also pleased to announce the launch of BigQuery’s data warehouse migration utility. Based on the existing migration experience, we have built this data warehouse migration service to automate migrating data and schema to BigQuery, and significantly reduce the migration time. You can find the documentation here. Our data warehousing migration offer and tooling equips you with architecture and design guidance from Google Cloud engineers, proof-of-concept funding, free training, and usage credits to help speed up your modernization process. You’ll receive expert advice, examples, and proof-of-concept funding support from Google Cloud, and you’ll work with our professional services or a specialized data analytics partner on your proof of concept. You’ll get free training from Qwiklabs, Coursera, or Google Cloud-hosted classroom courses to deepen your understanding of BigQuery and related GCP services. Google Cloud engineers will provide you with architecture design guidance, through personalized deep-dive workshops at no additional cost. Google Cloud’s professional services organization—along with our partners—have helped enterprises all over the world migrate their traditional data warehouses to BigQuery. And as part of this offer, qualified customers may also be eligible to receive partner funding support to offset the migration and BigQuery implementation costs.